Eric Klein and I have lamented on the podcast that hardware Kickstarters often show up extremely late, or fail to deliver. I’ve cut back on Kickstarter quite a bit, but still help fund the occasional board game. I’ve been disappointed on occasion, mostly due to over eagerness or improper expectations, but my delivery ratio has been pretty high. With one exception, every game I’ve Kickstarted has delivered — sometimes quite late, but delivered nonetheless. By my count I’ve helped crowdfund I’d like to mention three Kickstarters which sit comfortably ensconced in my board game collection. One ended up being pretty late, generating some controversy, but arrive it did. The other two arrived on time, and all three met or exceeded my expectations. Tokaido seems to be a leisurely stroll through a linear map representing a tour of Japan. Make no mistake, however: underneath the serene surface lies a pretty cutthroat racing game. But it’s a racing game with a few twists — the first to finish isn’t always the winner. I enjoyed the standard edition, but the collector’s edition, with it’s massive array of oh so cute painted miniatures proved irresistable. Tokaido: CE became a somewhat controversial game, partly because of the relatively infrequent updates by publisher Funforge and the long gestation period. This game took approximately 810 days from funding to delivery — the second longest board game Kickstarter I funded that actually delivered. Everyone who chose prepainted miniatures — me, included — were last in line to receive their deliveries. The miniatures don’t disappoint, and the larger board is excellent. 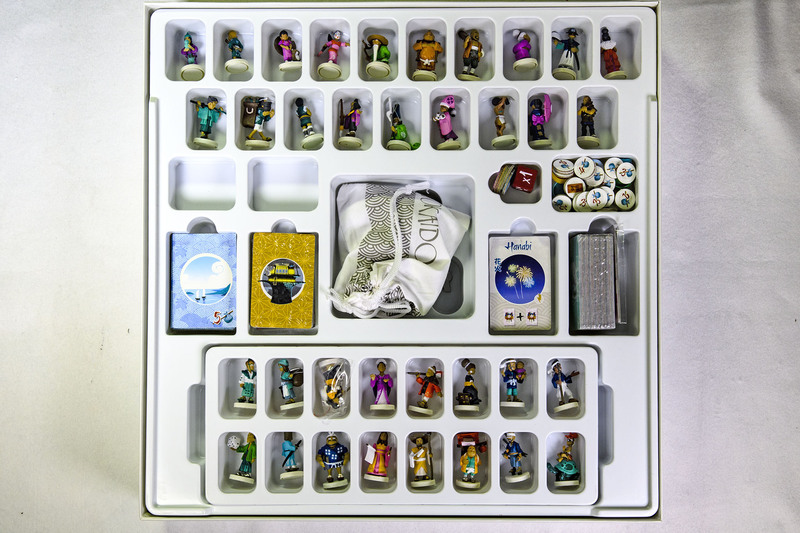 I knew what I was getting with Tokaido, and since I already owned the standard edition, waiting wasn’t a big issue. 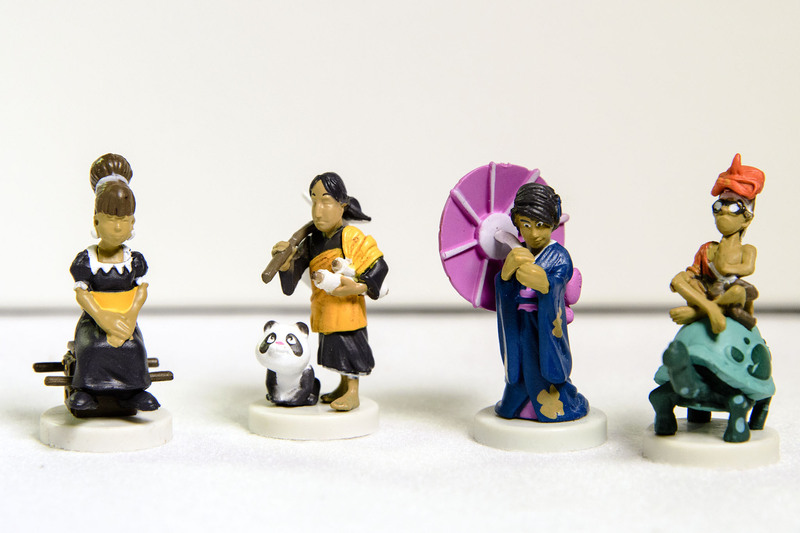 But the Tokaido CE Kickstarter certainly could have been executed more efficiently. Orleans represents the “point salad” sub-genre of Eurogames. 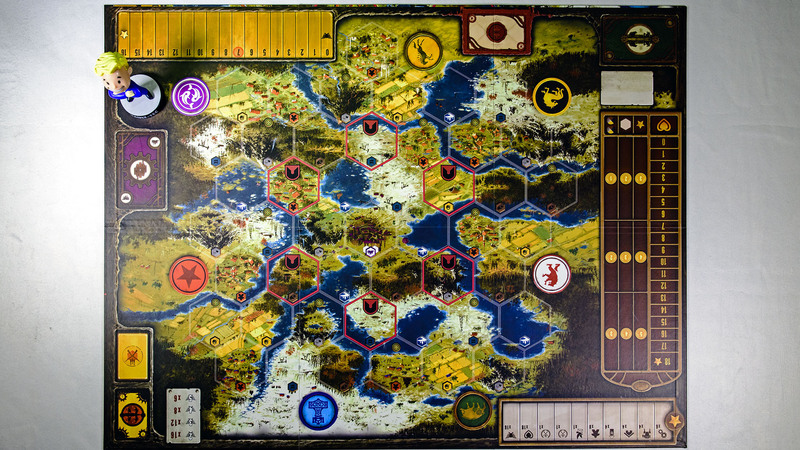 Take a little worker placement, a bit of a tech tree, some exploration and trading, and then tally up your points. You have multiple paths to victory, and there’s just enough interaction to keep things interesting. Unlike the Tokaido CE Kickstarter, Orleans Deluxe Edition had more modest goals: improve the board, up the component quality, and add a fifth player. Tasty Minstrel Games delivered. The tiles used for building new tech are thick and sturdy. The various boards — exploration board, five player boards, and beneficial deeds board all look great. 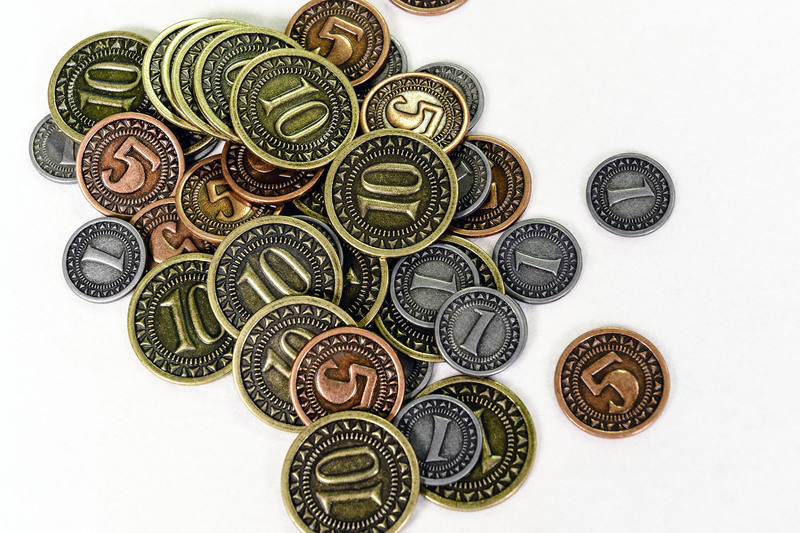 Paper coins get replaced by great-looking metal coins. So far, we’ve looked at a game where the publisher’s reach very nearly exceeded its grasp, and another where the goals were modest, but the publisher effectively delivered on those promises. Now let’s look at a particularly ambitious title that came out pretty well. Stonemaier Games has launched all its games through Kickstarter, and so far, every one has been a winner. I Kickstarted both Euphoria and Between Two Cities, two very good games in their own right. 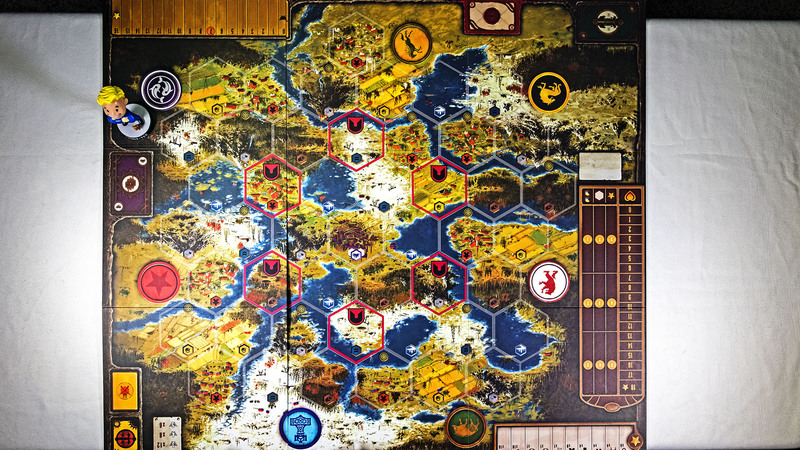 However, Scythe looks to be their most ambitious game to date, combining area control, resource collection, and light combat all initiated through an action-selection mechanism. The game was inspired by the art of Jakub Rozalski, a Polish artist who combined idyllic agricultural landscapes with hulking, diesel-driven mecha. The game itself plays out well. Players need to move out and control areas in order to harvest resources. Resources are used to build mechs, gain upgrades, complete objectives, and take on other players in combat. It’s all amazingly well-balanced, with no single feature or mechanic dominating the gameplay. Some randomization of players occurs at the start, since the player’s faction differs from their player boards. Both player boards and factions are unique. Factions have differing abilities while the player board determines your action-selection combos — but every player board’s pattern of action order differs. Players each have six wooden stars they place when achieving certain accomplishments; the game ends with the first player placing her sixth star. However, the winner is whoever has the most money at the end, not the person who ends the game. 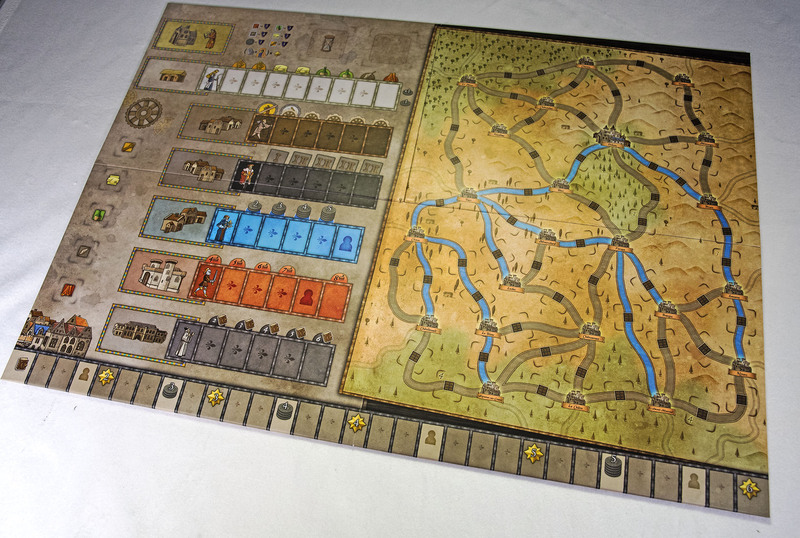 The Kickstarter CE version includes two boards. You can play with just one board, or you can flip the board over and add a second board to form a huge boards. The layout remains the same, just the size differs. I’ve placed Pip-Boy on the two versions of the board so you can get a sense of the scale. 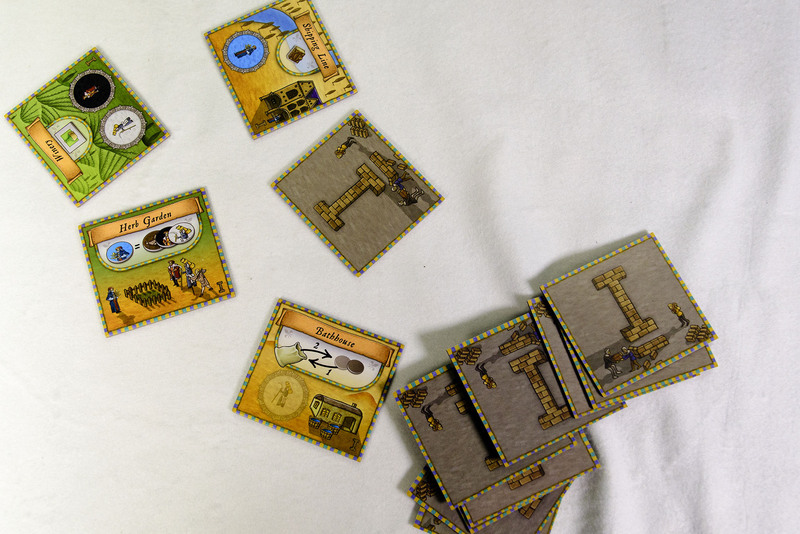 This is the smaller board, and the board which will be included in the retail game. And this is the collector’s edition combo board. I haven’t flattened the second board out completely in this shot, so the seam between the two boards is clearly visible. You can see how just how much smaller Pip-Boy looks here. The bits are all pretty good, with the mech miniatures simply utilitarian, while the character minis are well-sculpted. 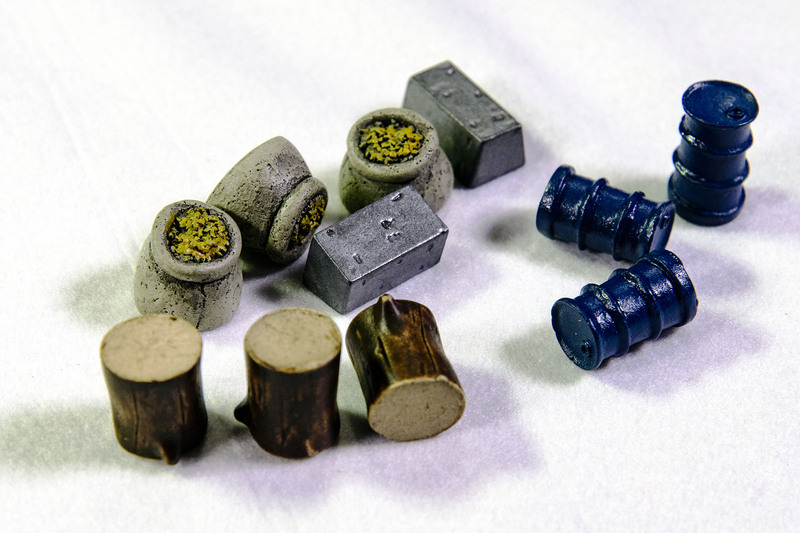 Given Stonemaier’s penchant for premium bits, metal coins and sculpted resource bits come with the CE. 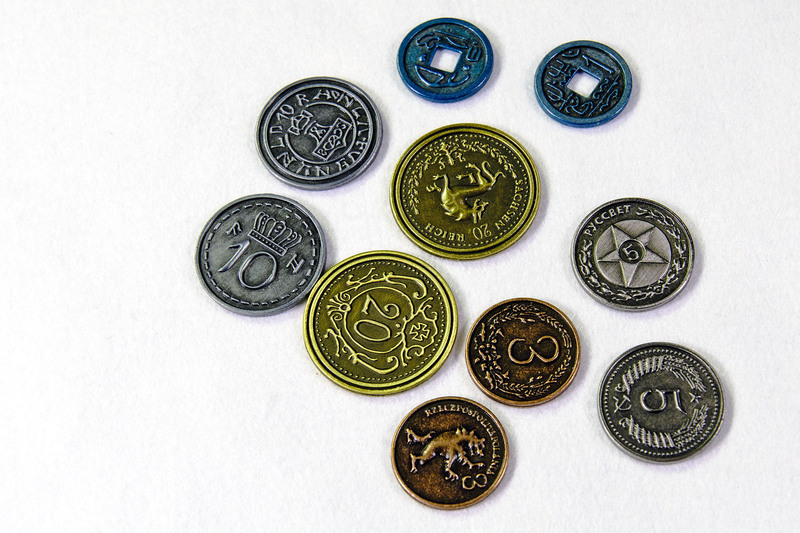 The coins look pretty cool, but the sculpted resource bits are amazing. I’ve only had a chance to bring the game to the table once, but given our experience, the game might just play as well as it looks. 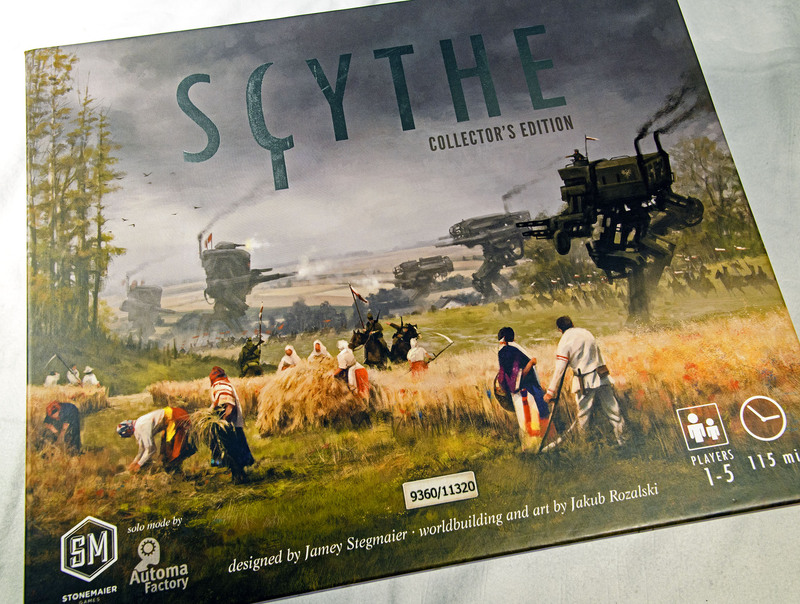 Stonemaier hit one out of the park with Scythe; it will be interesting to see the company’s next game.